Also, I don’t actually have an altar, per se, but – oh. I should’ve taken a photo of my myse board, that’s the closest I get to an altar. Oh well! Next time! XD Anyway, I haven’t done a big shrine round-up post like this for a while now, I don’t think, so it’ll be good to have it all documented in the one spot. 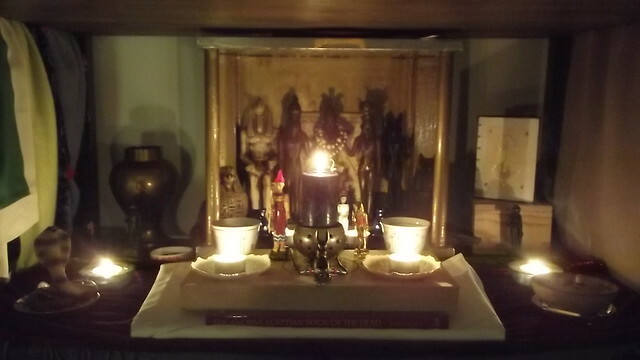 For any new readers, who’ve come here via The Pagan Experience, hi, have some new shrine photos. For everyone else, I hope this isn’t dull and repetitive. :D? Part of why I did all the cleaning yesterday was because it is Australia Day/Invasion Day/Survival Day/January 26th, and I had a Family Gathering with +elebenty new relatives I didn’t know before because who has five branches of our family in this city? I do. And we got them all together in a house, and it was hot, and we got back at, like, 4pm, and all the energy I have right now is for posting this stuff and trying to cool down. Preparations for Wep Ronpet. I made some new linens for the new year for Nut and Geb’s children, all hand-sewn. The (not always well-defined) ankh in the centre holds the material together, while the edging finishes it off. Nebthet has purple thread, Set has red, Heru-wer has brown, Wesir has black, and Aset has blue. Yas, it is time to prepare for Wep Ronpet, which, for me, starts on the 27th with the first of the Days Upon The Year. Because, for some reason, I can prepare ahead of time for Kemetic festivals, I started on some new linens for the god statues, made of some white fabric I’ve had lying around in my altar cloth box for years. I am not big on sewing, but I do find it a good method of stitching magical things together, so I do it for that reason. They’re sort of shaped like the sa amulets? Each is tailored for each statue, and they are sewn together, at the centre, with a long-stitched (not always very good) ankh shape. The edges are sewed with the same thread colour to finish it off. I think they turned out alright for someone who is not a sewer. I also wanted to do a bit of the Feast of the Dressing stuff done early, because that day, the 26th, is not only Australia Day, but I also have a family party to go to, and who knows when that will end? So it just seems easier to slowly work through those preparations now when I have the time, rather than wait and try to fit it all in during a single day. Altar after five days of elevation. Today’s rite hasn’t been done yet. I haven’t done today’s prayers yet, but I’ll do them later tonight when, hopefully, the epic. pain. from my uterus will cease enough for me to get through it without feeling like my guts are being stabbed. (The joys of menstruation. -_-) The rite itself has been, well, it’s been going. It’s certainly not ‘fun’ by any stretch of the imagination. It’s pour the water, read the prayers, raise the altar, pray for the dead, even if you’re tired, even if you don’t feel like it, like I did last night. I’ve had no real contact from the ancestors themselves, but I didn’t expect it, since I’m pretty headblind to them like I am with the gods. I can only assume the state of calm that comes over me when I do the rite is a good sign, and keep going. Do the work. Raise the ancestors. That’s the whole point of it. It’s never been about me, anyway. I also have this solidified idea for a Lamentations of Nit and Set for the Transgendered Dead that I am going to have to write at some point because otherwise I will be Nagged To Death by the gods about it, so. I might aim to have it ready for the last day of the rite, so I have some time to write and edit it and whatnot, so it’s not a rush job. Look for it on/after the 22nd, which will be the ninth day of the trans* rite for me. Also, to come, long rambly post about gender and Sobek and Hekate and other rambly nonsense, unless, by the time I’ve written it, it feels more suited to my Dreamwidth journal, in which case, it’ll be over there (though probably access-locked, so if you have an account there and want to read it, lemme know). But if this rite, and the past two weeks have done anything, it’s given me many Thinky Thoughts about gender, and transitioning, and the gods (there is a connection here, I promise), and I am going to need to tl;dr it all over the internet at some point, whether it’s here or there, so. That’s a Thing. Ancestor shrine set up for the Trans* Rite of Ancestor Elevation. This is after the ritual tonight. Antinous is represented by the snake – there are also some pennies for the dead resting around the snake’s body; Seshat is represented by the book on the right at the back, where I’m recording all the names of the TDoR dead, or at least, as many as I can fit there. 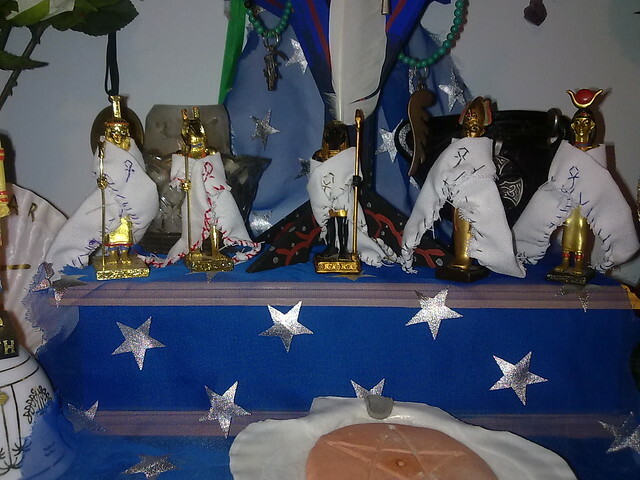 The shrine is sitting on top of my copy of the Book of the Dead. There are two cups with water, and the necklace Anubis is cradling is a trans* pride necklace with an ankh on it, which I found last week and decided I needed to have. I think the rest is self-explanatory? Wanted to get this written while it’s still fresh. Just done the first day’s rituals, albeit after midnight, but whatever. I find ancestor rites more powerful at night anyway. I decided to use one of PSVL’s prayers, the one to Antinous offered here, as well as a modified 70 Day prayers, and this one here. I also wrote an opening prayer/invocation, and an offering prayer. Apart from Antinous, I also invited Nit as bigendered Creatrix, Set as God of the Marginalised and Oppressed (His words; He wanted in when I was pondering Who to ask for help in this rite), and Wesir to join us, as well as Seshat, who remembers all the names, even if no one else does. The ritual came together later than I had expected, because I kept fiddling around with the order of the prayers, and tweaking the wording to make it work. I offered to the trans* dead as a whole, like I do when I do my normal 6th Day festival ancestral rites, because I don’t seem to attract individual ancestors? Or, at least, that doesn’t appear to be part of how I’m going to work with them. So I just address them as a whole, and hope for the best. I’ve actually never worked with Antinous before, but I just felt like He was the right god for this, along with Nit and Set. I can’t tell if He was there or not, but I think I probably got whacked by godsandancestors or something, because I cried basically the whole way through. There was definitely another presence there, even if I couldn’t tell who it was. I had an urge to rewrite the Lamentations of Aset and Nebthet for them to offer tomorrow, because obviously what this ritual needs is me crying as I try to read the words I’m meant to be saying while my glasses get all dirty from my tears. I have a feeling that’s a weird connection that won’t make much sense to anyone else, but IDK, it’s Wesir’s death, and my UPG of Wesir as a trans* god, and bringing His body back together, to make Him whole, and strong, again. Heru avenging Him. Welcoming Him back in peace. The dead being referred to as Wesir. All that stuff. It gets all tangled up in my head, and I’m almost crying again, just thinking about it. Anyway, it’s after 1am now, and bed is calling. Will check in with you later, internet. For now, my heart is heavy, but I feel glad I did it. May our trans* ancestors rest in peace. May Seshat remember their names for millions of years. Life, hey? I’ve been seriously busy these past few weeks and it’s thrown out many of my plans for posting here. Kept drafting them and then deleting them, or being too tired to think about what to write at all. I don’t mind, of course, because surprise visits by my brother and his family are always great, even if they drain my introvert spoons quite a lot. I mean, even today, I had wanted to spend most of it writing. Instead, I spent the morning building IKEA furniture, and then part of the afternoon organising and rearranging and putting things away and tidying and rearranging shrine things. I mean, srsly, I didn’t even get time to do my morning devotions, and I didn’t turn on my computer until 3pm. Go me! I mean, it’s great, because things are much better organised now, and it was work that needed doing. But, man, I had a Hallowe’en fic due today(ish) that I need to finish, and that hasn’t happened yet. Brain needs time to settle before I can get around to that. I had all these grand plans for a nice shiny dedicated launch of my Etsy shop, Shedety Scriptorium, but that hasn’t happened yet, because busy! and not enough brain to make it happen. But hey, there are a few things up there already, and I won’t complain if you buy them, either. :D? I still have a few things I need to add up there, too. Some I’ve taken photos of, others I still need to photograph. They haven’t gone up yet because, well, see above. But yes, I have a shop now, because scribe, and books, and prayer beads and whatnot. Plz go and take them off my hands so I have room to make moar things! – All the shrine update photos etc. Thought it was about time I did a proper post about the finished shrines. They take up a lot more of the room than the old ones did, and I guess that’s a sign of my shift in priorities and whatnot. It’s still undergoing minor adjustments, but otherwise, it’s done. Sobek’s named it the Shedety Shrine, so that’s what I’m going to keep calling it. It’s the name for the whole, as much as for the Sobek/Heru part itself. It doesn’t cover the other shrines around the room, but that’s alright. Those are kind of separate. This is a full working shrine, where everything is integrated into the whole. It’s nice to get used to using it, and lighting candles, and saying my prayers. Getting used to the new space, and what I can do with it, and when I need more space. What I want to show, and what can go away for now. 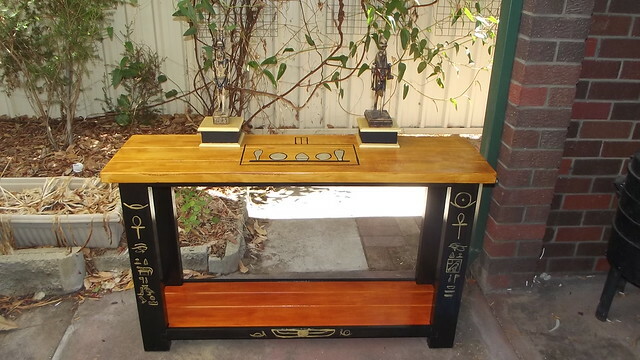 The festival shrine proved the hardest to place, but having it below the Sobek/Heru shrine seemed like the best place, and gave me the most space to work with. We’ll see how well it works over the course of the next year of festivals. I might make some adjustments as I go along as to how I lay things out, and make it work. Anyway, have a gallery of images, because there are 17 photos, and I cbf writing a tl;dr post of photos. It’s under the cut, and you should be able to click through to larger versions. I’ve added in as many proper explanations as I can for what’s there, but if anything’s unclear, feel free to ask. ..Sort of. The room is painted, but we’re still waiting for the floor to be put in. Don’t know when that’s happening. I slept in the TV room for a week while we got the room painted, but I’m back in my room now, paint-messed-up carpet and all because mum hates clutter and wanted her TV room back. Don’t know how long it’ll be until it’s done, but at least I can amuse myself by painting shelving. I still have lots to do there. Note paint-messed-up carpet, and other general mess all over the place. The shelf to the right will have most of my Pagan books, once I have that all set up properly. But for now, it just has a couple of shrines, since I still need to get the wall shelves up. I plan to do a proper consecration and enshrining rite once everything’s done. Right now, it’s only half-done, and I don’t want to waste my time reconsecrating twice. Anyway. Have some photos of the other shrines after the cut. I’ll do another post later on other assorted things that need a separate post. Like Artemis and other things. 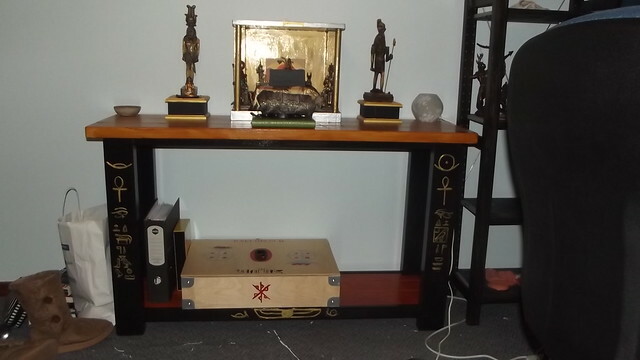 New Shrine – Almost Finished! Yeah! It just needs to be varnished now, to protect it from, well, stuff. I’m quite proud of how it’s turned out, in spite of some of my questionably formed hieroglyphs. It’s still not properly put together, but I’m waiting til after I’m done with the varnishing to do that. And as you will see from the photos below the cut, I did manage to find a varnish that would work with my other paints, so I have literally spent most of the day decorating it. NGL, it is super hard to put together hieroglyphic thingumies when you don’t have your books, and all you’ve got are three glyph fonts, and whatever you can find on the Intarwebs. I kind of had to bodge up a spelling for Bakhu since I couldn’t find one to copy. So if there is a proper rendering floating around somewhere, and I’ve bodged it up, well, sorry in advance. Anyway, have two photos and moar rambling about things.